Start Headcorn Station in town centre; car parks and on street parking (but to be sought out in roads behind the main street). Comment A good walk with variety and interest. The paths are not always easy to find, there are stiles and maybe gates to climb. This is a low lying area with many streams and ponds, so be prepared in wet weather. From Headcorn Station walk down the entrance road to meet the main road. Turn left and walk along, between shops, towards the parish church. Where the road turns sharp right, turn left through a lych gate and walk along a path of patterned bricks passing the church on your right. By the church doorway, turn left through an iron gate to go down a stone paved path in front of a line of cottages. Go down to the railway and cross over. Keep on on the stone paved path, over a concrete river bridge, to its end. Here cross a stile into a field on the right. Turn left across the corner of the field to a gap in the hedge. Enter the next field and keep on in the same direction, diagonally left, across the middle of the field to a pair of metal fieldgates in the far corner. Emerge onto a road and turn right. In 100 metres, where the road turns right, look left for a green metal barrier gateway with a rather pathetic stile next to it. Leave the road into a field and cross to a footbridge. Keep on across the next field towards a house. Emerge onto a country road and turn left with care. In a few paces, turn right off the road up a gravel drive to Waterlane Cottage, almost immediately, bear right into a narrow enclosed path. Follow this path as it zigzags around to the left around a chicken farm. Follow a stream to a stile and cross into a thicket. Soon reach a footbridge and stile into a field and walk up with a fence on the left to a double fieldgate. Cross to a road. Turn right on the road and pass Headcorn Place. At the end of the road reach Place Farm on the right. Turn left between a pond and an oast to enter a field through a metal fieldgate. At the bottom corner, go through (or climb) a fieldgate and go forward to a farm bridge over a stream. Turn right and follow the hedge on your left to its end in a corner. Cross a stile by a metal gate and go up a field edge with a hedge on your right. At the end of the hedge turn right into a broad grassy way to Chillenden Farm house. At the garden gate of the farm and a pond on the right, turn left through a gap in the hedge into a field. Two paths start here. Take the righthand of the two and walk, diagonally right up a huge, gently rising, field, to a stile in the very top corner by trees and a pond. Pass the end of a stream in midfield. 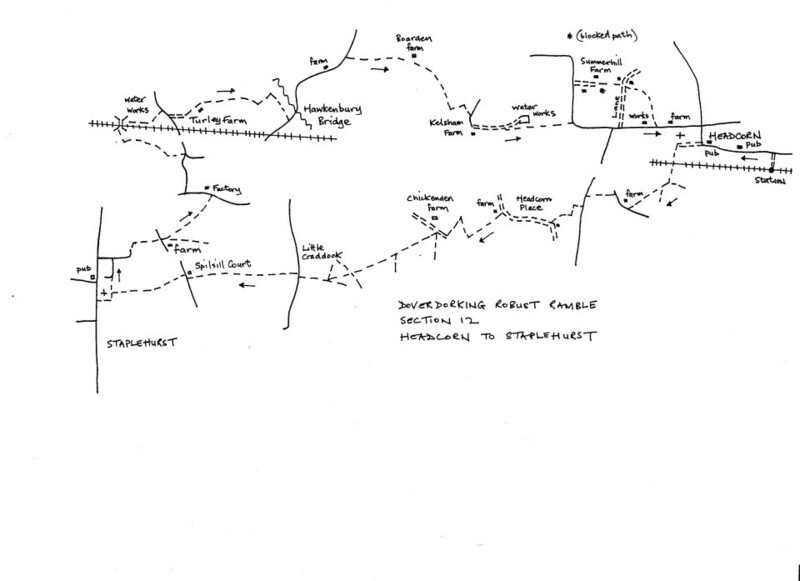 (the OS Explorer map shows several hedgerows which have disappeared). At the top corner, cross the stile into a field and keep on in the same direction down towards the opposite corner. Just short of the corner is a gap in the hedge on the right. Turn through the gap and then go straight ahead by a lone tree to a stile in a hedge and a road. Then keep ahead up the open field to a gap at the top then on with a hedge on your left to a corner. Turn right along to a tree and a junction of paths. Ignore the path straight ahead and turn left to follow the hedge line on your right towards a building ahead. Keep on along the field edge, passing Spilsill Court, to meet a driveway. Cross the drive and pass by double wooden fieldgates. Go right across to a telegraph pole. Here there is a junction of paths. Turn left into a path enclosed between wire fences. At the bottom of the field on the right, keep on into an enclosed path which emerges into Staplehurst churchyard. Walk past the church to the main road. The Bell Inn opposite is now closed, so bear right down to the King’s Head. This is the end of the section.